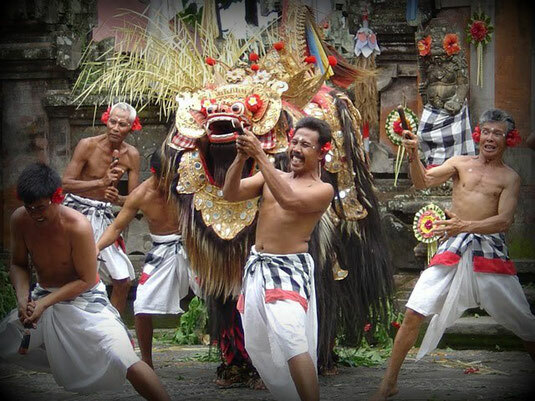 Dance and drama have historically played an important role in Balinese society. Through this medium, people learned about the tales of the Ramayana, Mahabarata, and other epic stories from Balinese history. The following are brief descriptions of some of the better known dance-dreams that are performed regularly on Bali. This is a warrior's dance. It is usually performed by men, either solo or in group of five or more . The dancers try to portray the full range of emotions displayed by a warrior, such as anger, courage, ferocity and passion. It is a dance that requires great skill, with the artist having to display the whole range of inner emotions, mainly through facial expressions. This is basically a story about the struggle between good and evil. Good is personified by the Barong Keket, a strange, fun-loving creature in the shape of a shaggy semi-lion, and evil is represented by Rangda, a witch. Ultimately, the two characters engage in battle, at which point the Barong's keris bearing followers rush in to attack Rangda. The witch, however, uses her magical powers to turn the keris knives in upon their owner's, who fall into a trance and begin to stab themselves. The Barong uses magic to protect his followers from the knives. In the end, the Barong triumphs and Rangda retreats to recuperate her strength for the next encounter. 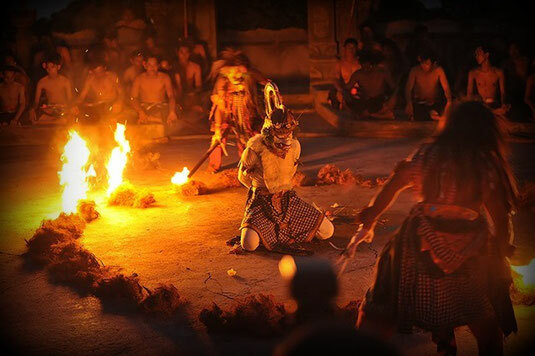 The Barong and Rangda dance is a very powerful performance and is not taken lightly by those involved, nor should it be by those in the audience. The Kecak, as a dance, developed in the 1930's, in the village of Bona, where it is still performed regularly. The theme is taken the Ramayana and tells the story of Rama, who, with the help of the monkey army, tries to rescue his wife from the clutches of (the evil) King Rawana. This is a very exiting dance to watch, and is performed by a large group of chanting men sitting in a circle, chanting & waving their arms and swaying to and fro in unison. This dance tells the story of Princess Rangkesari who is held captive against her will by King Lakesmi. Rangkesari's brother, Prince Daha, gathers an army together to rescue his sister. Princess Rangkesari then tries to persuade Lakesmi to let her go to avoid a war, but he denies her her freedom. On his way to battle, Daha is attacked by a raven (a bad omen), and is later killed in battle. The dance only takes the story up to the point where the king departs for battle, and it is performed by three people, two 'Legongs' and their attendant, the 'Condong'. The Legong is a classical and graceful dance, and is always performed by prepubescent girls, often as young as eight or nine years old. The Sanghyang is the force that enters the bodies of the entranced dancer. There are a number of Sanghyang dances, but the most common are the Sanghyang Dedari and the Sanghyang Jaran. The Sanghyang Dedari is performed by two girls, and is very similar in style to the Legong; the main difference is that the Sanghyang Dedari girls are supposedly untrained and can keep in perfect time with each other, even though their eyes are firmly shut. The accompanying music is provided by a female choir and a male Kecak choir. In the Sanghyang Jaran, a boy dances around and through a fire, riding a coconut palm hobbyhorse. This is frequently called the "Fire Dance", for the sake of tourists. In both dances, a priest is always on hand to help bring the dancers out of their trance-state at the end of the performance. In Bali, masks are considered sacred objects and are revered as such. 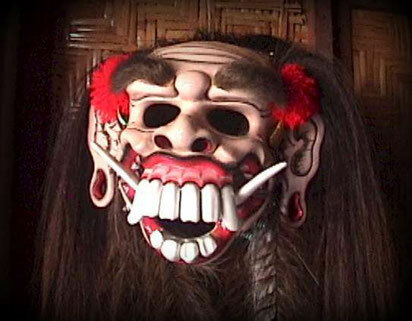 The best ones are traditionally carved on auspicious days and the dancers who wear them are believed to be possessed by the spirits of the masks. Characters can be identified from the shape of the features; noble characters always wear full, refined masks; while evil is represented by bulging eyes and garish colors. The characters are silent, but communicate using complex gestures of the hand, head and body. The story lines usually follow popular myths, or episodes from history. Wayang Kulit is one of the great storytelling traditions of the Javanese and Balinese. The Wayang show normally consists of a small 4 piece orchestra, which provides the musical accompaniment, to around 60 'puppets' carved out of flat pieces of water buffalo hide and the Dalang (puppet master.) The Dalang has to be both incredibly skilled, as well as knowledgeable, and he not only manipulates all the puppets, but also provides a different 'voice' for each one. Good characters normally speak in ancient 'Kawi' and the evil or coarse characters speak Balinese. The Dalang, must be fluent in both languages. The main religion is Agama Hindu Dharma, which arrived in Bali with the spread of Hinduism via Sumatra and Java during the 11th century. Although originally from India, the Balinese religion is a unique blend of Hindu, Buddhist, Javanese and ancient indigenous beliefs, with customs that are very different from the traditional form of Hinduism practiced in India today. The Balinese worship Brahmana, Shiva and Vishnu, who are seen as manifestations of the Supreme God Sanghyang Widhi. Ganesha (the elephant-headed god) is also visible, but more commonly, one will see shrines to the many gods and spirits that are uniquely Balinese. 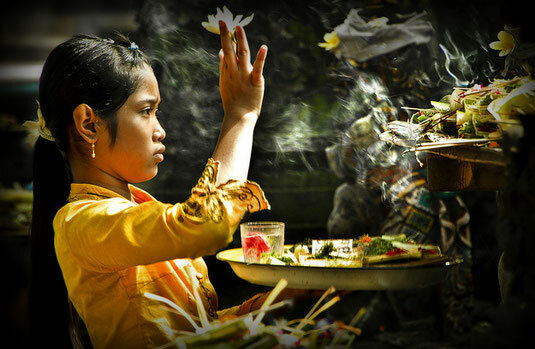 The Balinese believe strongly in magic and the power of spirits and much of the religion is based upon this. There is a belief that good spirits dwell in the mountains and that the seas are home to demons and ogres. Most villages have at least three main temples; one, the Pura Puseh or "temple of origin", faces the mountains and is dedicated to the village founders, another, the Pura Desa or village temple, is normally found in the center and is dedicated to the welfare of the village, the last, the Pura Dalem, is aligned with the sea and is dedicated to the spirits of the dead. Aside from these "village" temples, almost every house has its own shrine and you can also find monuments dedicated to the spirits of agriculture, art and all other aspects of life. Some temples, Pura Besakih for example, on the slope of Mount Agung, are considered especially important and people from all over Bali travel to worship there. "Offerings" play a significant role in Balinese life as they appease the spirits and thus bring prosperity and good health to the family. Everyday small offering trays (canang sari) containing symbolic food, flowers, cigarettes and money, are placed on shrines, in temples, outside houses and shops, and even at dangerous crossroads. Festivals are another great occasion for appeasing the gods, where woman bear huge, beautifully arranged, pyramids of food, fruit and flowers on their heads. There are traditional dances and music and the gods are invited to come down to join in the festivities. There are many festivals that are well worth observing.